A list of the accepted papers and abstracts is now available here. 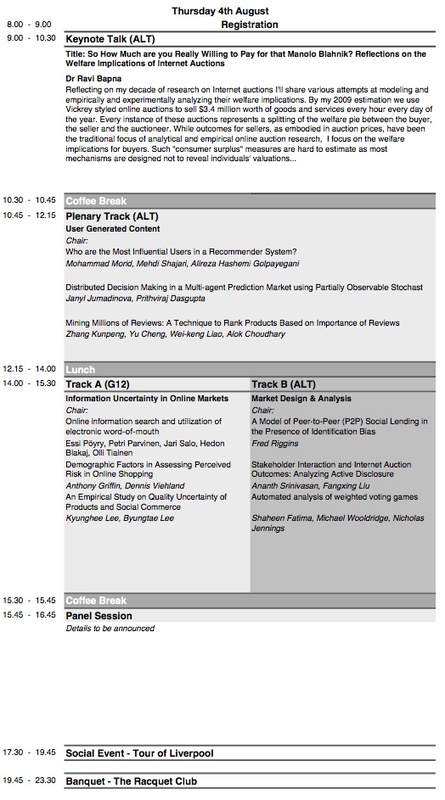 The full schedule, as well as the keynote talks is listed below. 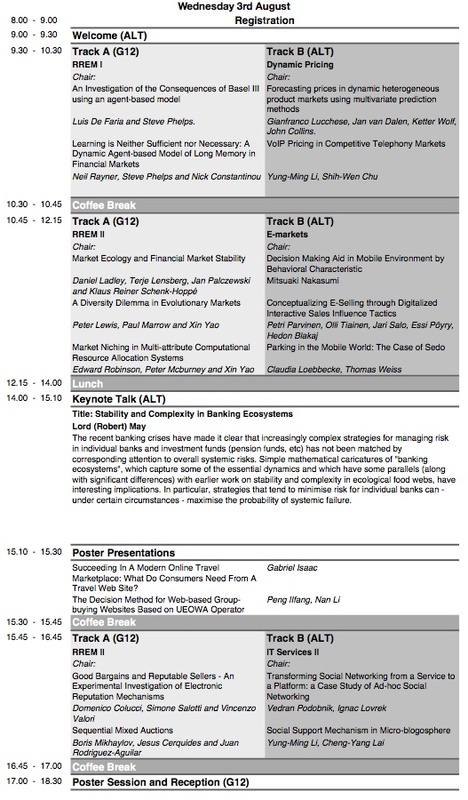 Abstract:The recent banking crises have made it clear that increasingly complex strategies for managing risk in individual banks and investment funds (pension funds, etc) has not been matched by corresponding attention to overall systemic risks. Simple mathematical caricatures of "banking ecosystems", which capture some of the essential dynamics and which have some parallels (along with significant differences) with earlier work on stability and complexity in ecological food webs, have interesting implications. In particular, strategies that tend to minimise risk for individual banks can - under certain circumstances - maximise the probability of systemic failure. Bio: Robert McCredie May, Lord May of Oxford, OM AC Kt FRS, holds a Professorship at Oxford University and is a Fellow of Merton College, Oxford. He was President of The Royal Society (2000-2005), and before that Chief Scientific Adviser to the UK Government and Head of the UK Office of Science and Technology (1995-2000). 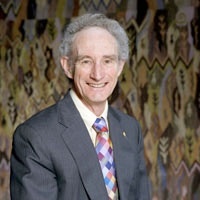 His career includes a Personal Chair in Physics at Sydney University aged 33, Class of 1877 Professor of Zoology at Princeton, and in 1988 a move to Britain as Royal Society Research Professor. Particular interests include how dynamical systems are structured and respond to change, particularly with respect to infectious diseases and biodiversity. Honours include: the Royal Swedish Academy’s Crafoord Prize, the Swiss-Italian Balzan Prize, the Japanese Blue Planet Prize, and the Royal Society’s Copley Medal, its oldest (1731) and most prestigious award. 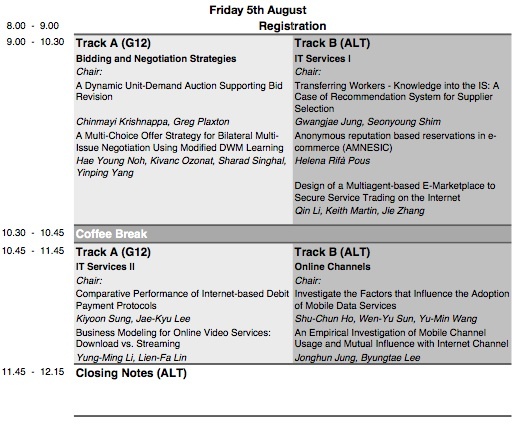 Abstract: Reflecting on my decade of research on Internet auctions I'll share various attempts at modelling and empirically and experimentally analysing their welfare implications. By my 2009 estimation we use Vickrey styled online auctions to sell $3.4 million worth of goods and services every hour every day of the year. Every instance of these auctions represents a splitting of the welfare pie between the buyer, the seller and the auctioneer. While outcomes for sellers, as embodied in auction prices, have been the traditional focus of analytical and empirical online auction research, I focus on the welfare implications for buyers. Such "consumer surplus" measures are hard to estimate as most mechanisms are designed not to reveal individuals' valuations. I share both relative and absolute measures in multi-unit and single-unit auctions respectively. A key breakthrough in deriving relative measures in the context of multi-unit auctions was to empirically derive a stable taxonomy of bidding strategies. A key breakthrough in deriving absolute measures on eBay was to deploy a real-world bidding agent to learn about individual preferences under truth-telling dominance. Online auctions also came with new institutional artifacts, such as ebay's hard closing time that led to the prevalence of new bidding strategies such as last-second bidding or sniping. I'll conclude by shedding light on the welfare implications of sniping on eBay, as extant research has yet to inform us on returns to sniping. 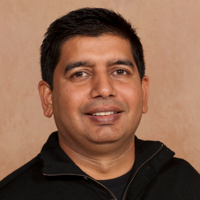 Bio: Dr. Ravi Bapna is the Board of Overseers Professor of Information and Decision Sciences Department at the Carlson School of Management, University of Minnesota. He also serves as the Executive Director of the Srini Raju Centre for Information Technology and the Networked Economy (SRITNE) at the Indian School of Business. He teaches graduate students and executives on how to align business and IT for sustainable competitive advantage. The ICEC 2011 Banquet will be held at the Racquet Club, on Thursday 4th August at 7.30pm.